The three spires of Litchfield Cathedral. Lichfield Cathedral is situated in Lichfield, Staffordshire, England. 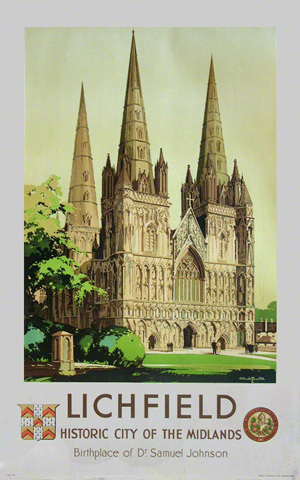 Claude Buckle’s railway poster was originally painted in the 1930’s and released under LMS (The London Midland and Scottish Railway) with the theme of “Historic city of the Midlands”. 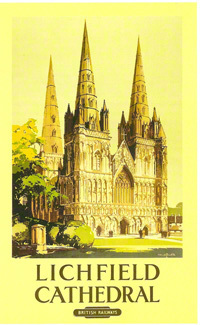 It was re-issued by British Railways in 1948 containing the BR logo and the writing “Lichfield cathedral”. It is the only medieval English Cathedral with three spires. Lichfield Cathedral is one of the major cathedrals of England and is truly a magnificent structure of enormous size. The inside of the Cathedral is very interesting and well worth a visit. Created in 1935. The release of the poster in 1948.